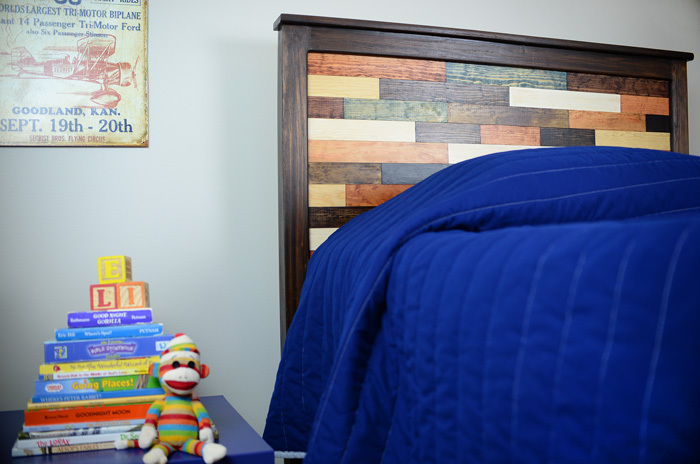 This entry was posted in Bedrooms, Decorating, Frugal living, Furniture, How to, Kids stuff, Reviews & giveaways, Sponsored, Thrifty finds, Videos and tagged HomeRight, Plank bed, Wooden planks by Susan. Bookmark the permalink. Wow what an amazing headboard transformation!!!! I would have so many projects for a HomeRight sprayer but first on the list is my kitchen cabinets! Thanks for the chance. Love the headboard. I would use the sprayer for lots of projects including furniture! I have walls that need to be painted. I love your products. 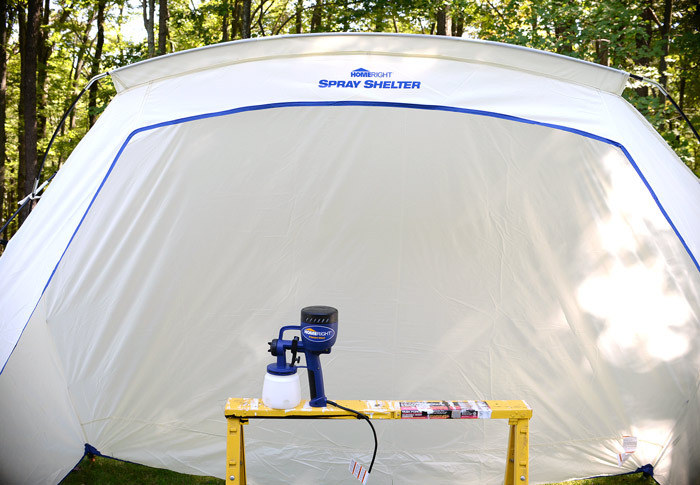 I love reading about all the things you can do with this HomeRight sprayer shelter. I make a mess when I spray and this would help. Thanks for doing this. I would use it on a hutch I have. I would love to own this great looking and working sprayer……….I live in Canada but , I still can dream of doing so much more for my home without asking for outside help..
My Kitchen table has these angled, carved legs with sort of buttress type things that are pretty cool looking. It’s old, for the 1930s. I want to remove the legs and leave the top in the wood finish and paint the legs red. Hard with the lacy parts, but doable with a sprayer. I would get one of those neat spray tent things too. 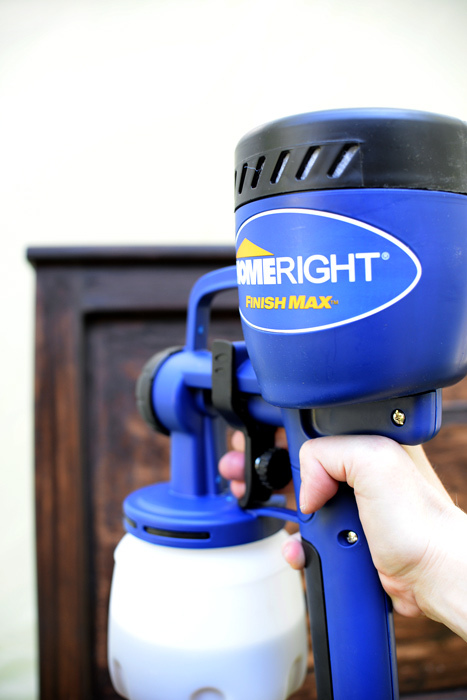 I would love to use the HomeRight FinishMax to tackle my headboard and a dresser. Wow another great job! I bet your son loves it, huh? I really, really need this give away. I have so many projects to paint right now. I have a whole set of bedroom furniture in my guest bedroom, I have a huge secretary that needs painted and some chairs as well. I could go on….. Thanks for the chance to participate. Love the bed. Am in the process of refinishing a cart for a great grandchild and would love the Home Right sprayer. I would repaint an old dresser. 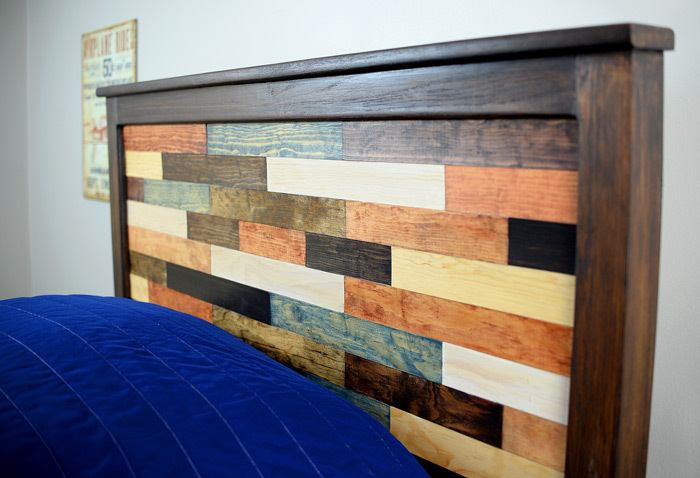 I love this headboard. What a beautiful, creative idea perfectly executed! Wow! I love, love how it turned out. And so appropriate for a big boy! Once again, you outdid yourself! Thank you so much for sharing and inspiring me! My daughter’s bed needs a redo and she wants a dark stain. 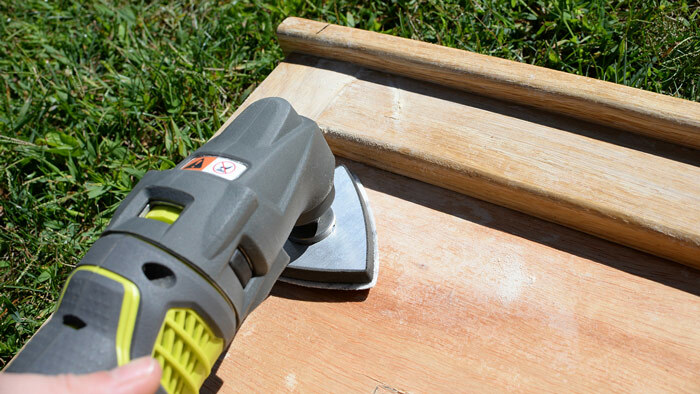 This would be very useful to remove the old stain. I want to paint my dining room table and chairs, some bookshelves and a couple of dressers! Bookcases and kitchen cabinets for a start. I love that headboard! 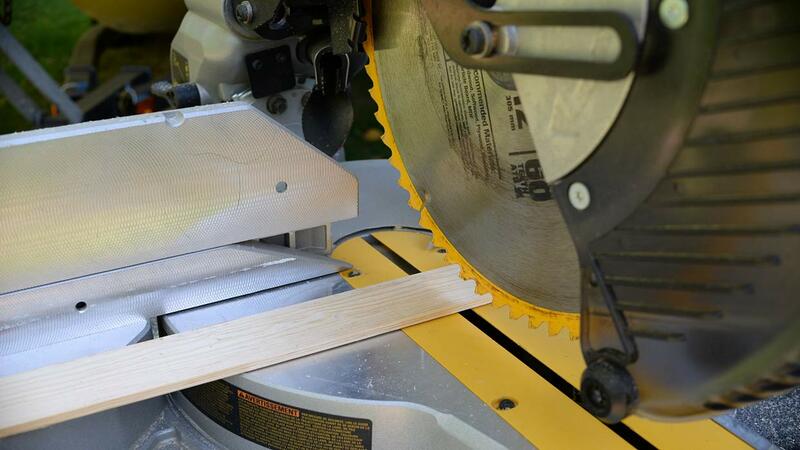 I would like to copy that idea to use in the back of a nook I am putting shelves in. We are building a garage apartment and to save money, my husband and I are finishing the interior ourselves as well as painting inside and outside. 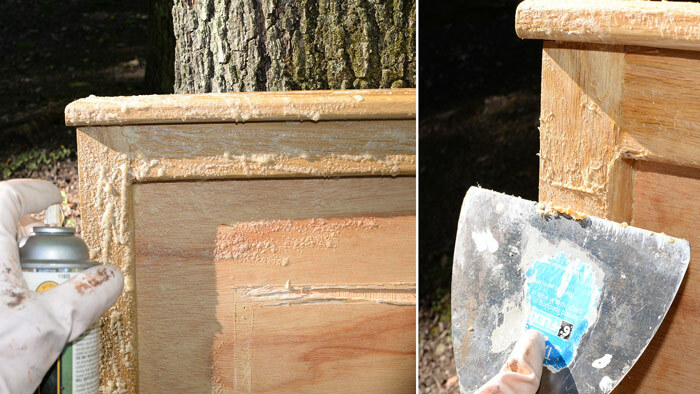 Both the HomeRight Finish Max and Spray Shelter would make our job soooo much easier!!! 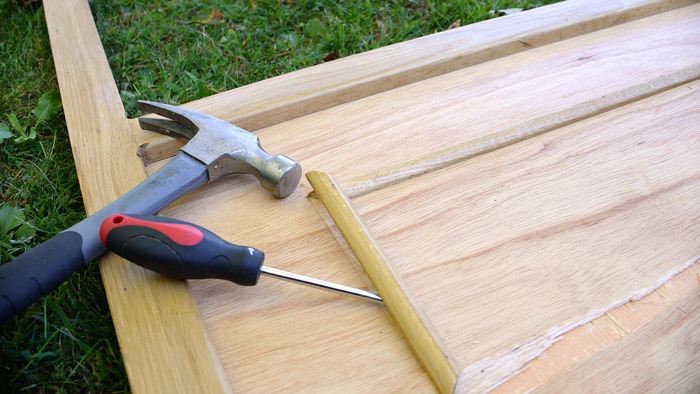 I am getting ready to build my dining room table. I desperately need it. I don’t want drips caused from brushes. I would love to have this! I am renovating an old historic building in New Orleans to open a BnB. 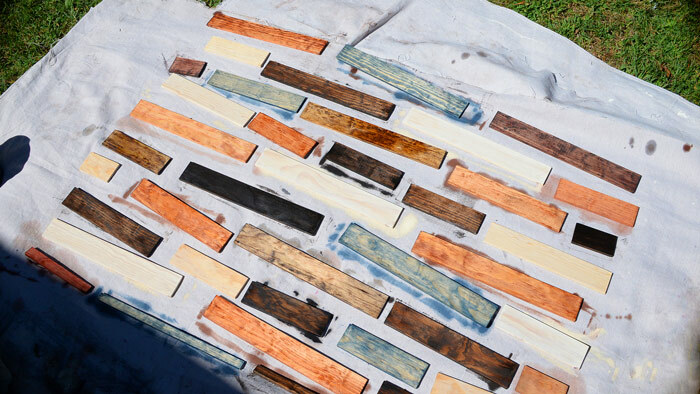 I try to use as much salvaged materials as I can find which usually means some staining & painting! I would use this to tackle our kitchen cabinets. I would love to refinish my table. OMG that is so beautiful, you did a wonderful job on the headboard. Give yourself a big pat on the back! Very pretty headboard. Love this idea! I would love a sprayer. I paint a lot of furniture and would love using a sprayer for some of my jobs. This turned out so cute! Such a great imagination you have that you were able to turn something so boring into something amazing! 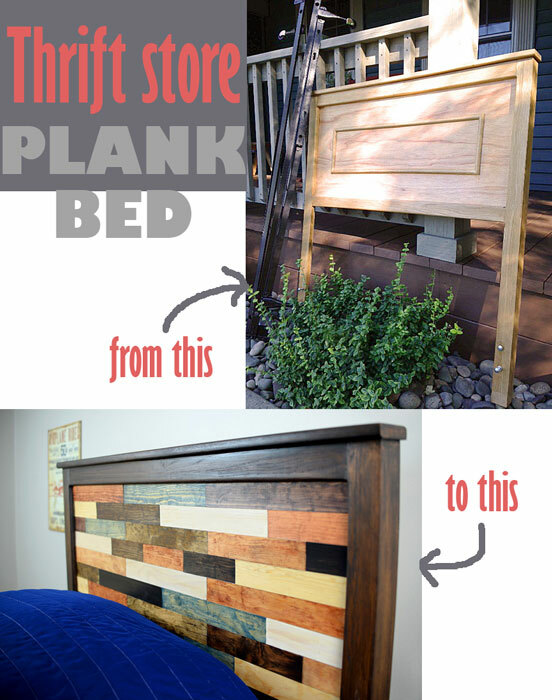 I would use it redo my Grandpa’s old bed and dresser. Thanks for the giveaway. I would spray my dining table! That bed looks AMAZING. I want to copy you and do the same thing to a king sized head board in my room now. 🙂 If I won, the first project I would do is to refinish some vintage wooden doll furniture for my daughter. I’d first tackle the basement. We just finished it and the walls need some paint. I’m dying to paint my kitchen cabinets. 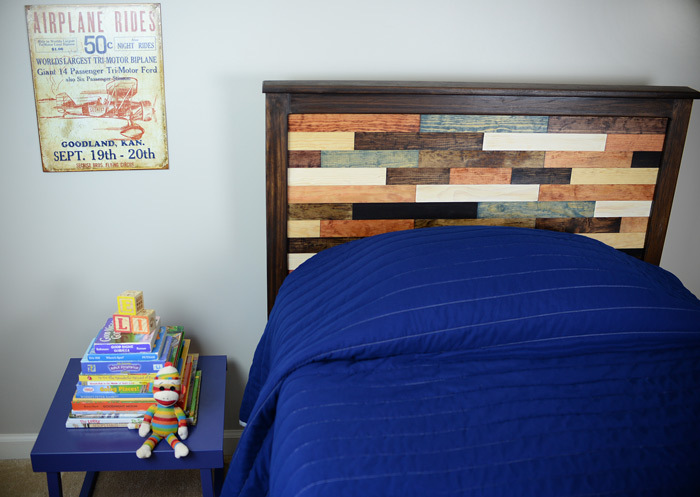 Love the headboard and all the patchwork colors, GREAT Idea. I have so many things to paint that a Homeright sprayer would come in so handy. Love your son’s new bed head board. I have a few large furniture pieces waiting for me to start and the homeright products would be so helpful. Wow! The headboard turned out amazing. I would use it to paint my kitchen cabinets! I would redo the dining room table. I have a few bookcases that are straight outta the 80s: bleached oak finish, smoked glass doors …. if they weren’t so ugly I’d be tempted to call them ‘vintage’. I would love to bring them into this century with some paint. FIrst off, I LOVE the headboard! I may have to try that 🙂 I would use the spray gun to paint my holiday DIY projects. Thanks! 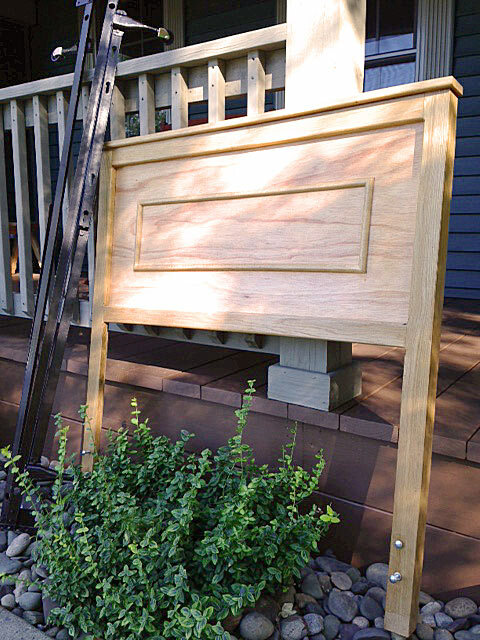 Gorgeous headboard! And you make it look so simple!! 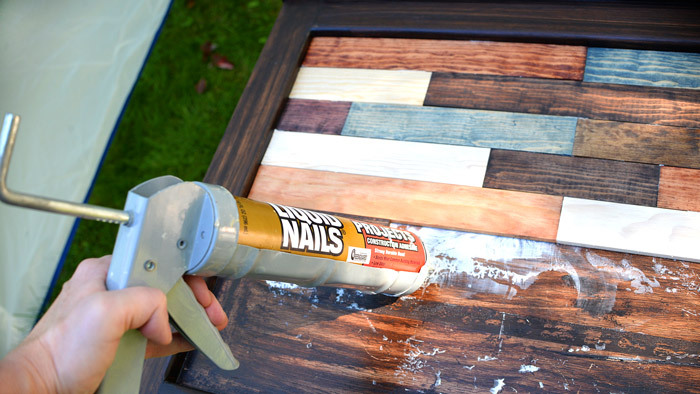 I could totally use the Homeright products to refinish a table/chairs set that I have in the storage. I would like to re-stain my end table. Gosh, I have so many projects that need to be painted. The sprayer looks amazing. I would use this on outdoor furniture, dining room chairs, a dresser and so much more. I might even attempt my kitchen cabinets that need some serious love. 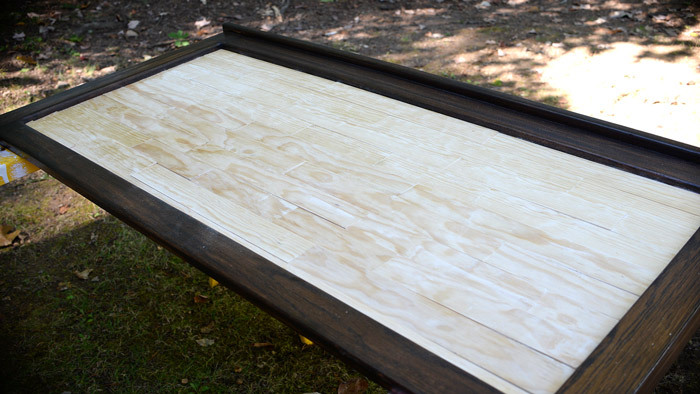 My beautiful table recently got stained. I would use this to re finish it! I have a table i desperately meed to redo! And next, the walls! I’d love to try one of these sprayers! I have a bunch of bead board that needs to be painted so I can finish my bathroom reno. Not what I’d expected, but quite nice! That is just cute! I had been planning on getting the Home Right sprayer, and then my husband lost his job. As soon as he goes back to work, though, it’s mine. This Nana is getting ready to refinish baby furniture. Love the idea of the headboard interesting to look at but not too funky that or would be quickly outdatex. Your headboard is so cute! 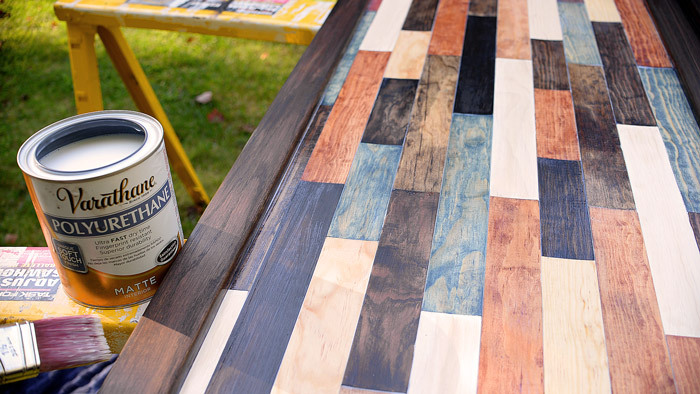 i love how you mixed the different stained pieces. I would never have though of that. I bet you son loves his new big boy bed! Wow! What a great idea. Looks amazing. I’ve have so many ideas for painting a vintage secretary desk and tons of other furniture. I wasn’t sure what to do until I discovered Home Right products! 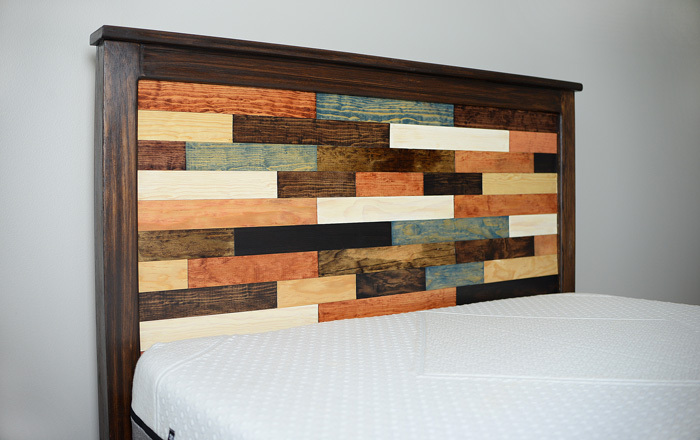 Love the headboard and I thought your name craft was actually metal! Looks great. Now I have a desk I need to tackle! I have a dining room hutch in serious need of a makeover – I’d paint that in a heartbeat! What a fantastic transformation. I have never thought to use my sprayer with stain. Will have to try that! I’m sure it saves a lot of time. So many projects, so little time. Wow! It looks amazing. I need one of those sprayers in my life. A work of love! 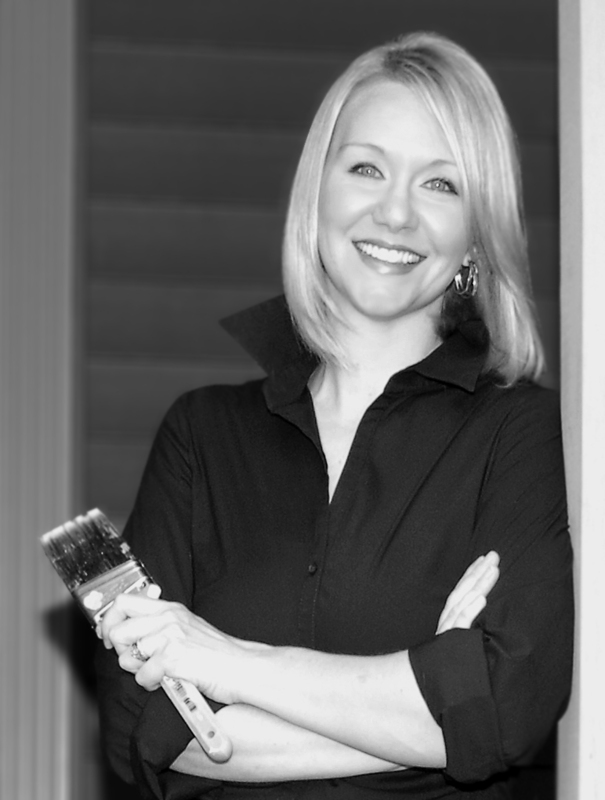 In my home, I would start by spray painting all our louver closet doors. I like the bed after. Have some shutters I’m making that will need to be painted soon this would be great for thst. I would use it to paint a table and chair I’ve been putting off! I would just start painting everything!